t Domaine Hubert Bouzereau-Gruère in Meursault there are both grand and premier crus. 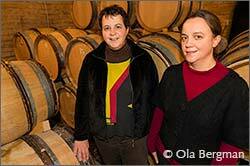 But if you ask the Bouzereau sisters – Marie-Laure and Marie-Anne – who run the estate it is a village appellation wine which is the jewel of the domaine – Chassagne-Montrachet, Les Blanchots Dessous. 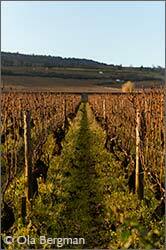 – It is village appellation, but it is just next to a grand cru, Criots-Bâtard-Montrachet, says Marie-Anne Bouzereau. The vines are 40-45 years old and the yields are very low. It is a very rich, complex wine, with notes of white peaches and white flowers. You will find Les Blanchots Dessous at the northern end of Chassagne-Montrachet, just next to the Autun road. The grand crus of Chassagne-Montrachet and Puligny-Montrachet are to the immediate north. To the west is Blanchots Dessus, a Chassagne-Montrachet premier cru. – Les Blanchots Dessous forms something of a basin in the vineyards, continues Marie-Anne Bouzereau. 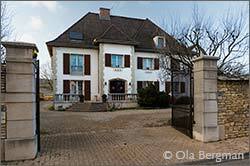 Our parcel is just next to Lalou Bize-Leroy’s parcel of Criots-Bâtard-Montrachet. The vines in Les Blanchots Dessous are planted with an east-west row orientation, whereas the ones in Criots-Bâtard-Montrachet are planted with a north-south row orientation. Today’s Domaine Hubert Bouzereau-Gruère covers ten hectares. 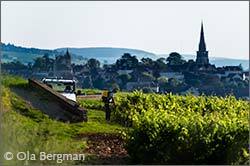 Focus is on Meursault and Chassagne-Montrachet, but they have vineyards in six villages, from Aloxe-Corton down to Santenay. Three quarters are white, one quarter red. 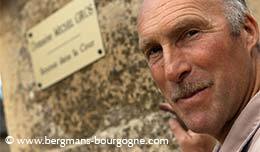 – Our father used to do most of the work at the domaine himself, says Marie-Laure Bouzereau. Today we are five. We have two employees and our father does all the work with the tractor. 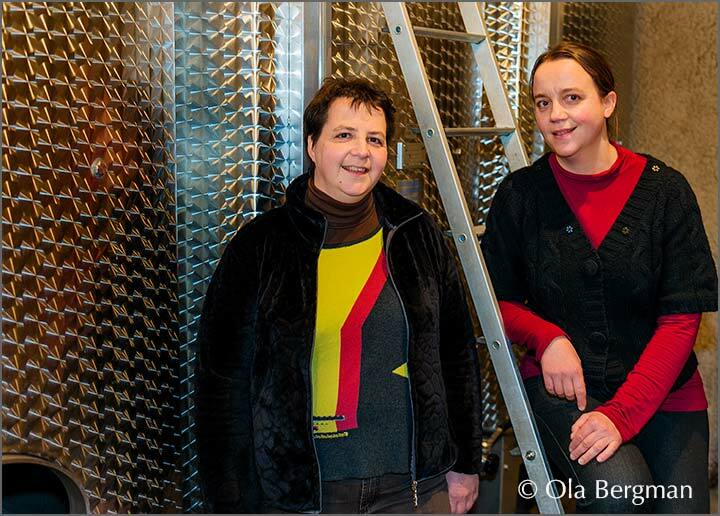 Both sisters arrived at the domaine after wine school, Marie-Laure in 1995 and Marie-Anne in 1999. Since then quality control has become stricter. More new oak is being used, but still not in excess. – We did not want to start a revolution, says Marie-Laure Bouzereau. 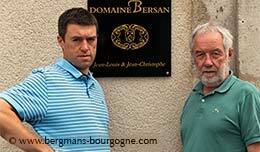 To a large extent we are running the domaine like our father did. But developing the commercial side of the domaine allowed us to buy more new barrels and a pneumatic press. Domaine Hubert Bouzereau-Gruère makes three different village appellation Meursault cuvées – Meursault, Meursault Limozin and Meursault Les Tillets – and two Meursault premier crus – Charmes and Genevrières. The straight Meursault comes from Les Pelles, a lieu-dit just outside the village on the Puligny-Montrachet side. 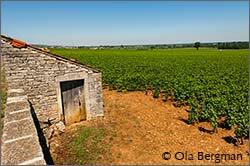 A little bit further down the road, just before Charmes, you will find Limozin. – Compared with Les Tillets I would say that Limozin is more of a typical Meursault, says Marie-Anne Bouzereau. Les Tillets is at the top of the slope and it is a more mineral wine. It is late ripening always our last Meursault to be harvested. It is more than 300 metres in altitude, which makes it one of the highest parcels of village appellation in Meursault. The forest is just above and the soil is clay and limestone. Les Tillets is a wine that ages very well. The Meursault Charmes of the domaine is a blend from the two parts of this premier cru – Charmes Dessus and Charmes Dessous. 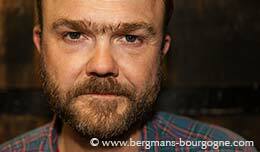 The two parcels of Domaine Hubert Bouzereau-Gruère are equal in size, one in the upper part and one in the lower. 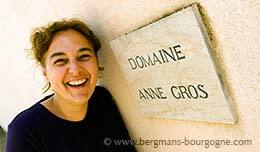 – In Charmes Dessus we are in the top part at the premier crus crossroads, where Charmes, Perrières and Genevrières meet, says Marie-Anne Bouzereau. We are just below Perrières, so it is a very mineral parcel. – In Charmes Dessous you have concentration and fruit. We press the two separately to be able to see how much we have of each. Then we blend the must. Together they create a very nice complexity. The Genevrières is an almost non-existant cuvée. It is a very small parcel, which means in a good year they can make 750 bottles. The parcel is in Genevrières Dessous, the lower part of Genevrières. 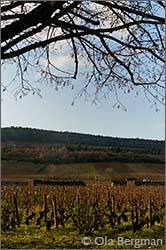 – Our Genevrières parcel is on the same level on the slope as our Charmes Dessus parcel, says Marie-Anne Bouzereau. They are only 50 metres apart. While Charmes is rounder and more powerful than the Genevrières, which is more about finesse and elegance. A discreet wine. In the valley that leads in to Saint-Aubin Domaine Hubert Bouzereau-Gruère has two Saint-Aubin premier crus – Le Charmois and Les Cortons. One on each side of the road. – The vines in Le Charmois are between 40 and 45 years old, says Marie-Laure Bouzereau. Many of our vines have the same age, because when our father started out he replanted a lot. Le Charmois is bordering on Chassagne-Montrachet. Les Cortons, on the opposite side of the road, is younger though. 20 to 25 years old. Les Cortons is steeper than Le Charmois. It is stonier, more limestone. It produces a wine with lots of minerality. Very fruity, very citrusy. In red there is quite a span geographically. There is a grand cru up in Aloxe-Corton, a Corton Bressandes, and there is a village appellation Santenay, a blend from the lieux-dits Les Prarons and Les Hâtes. In-between there is Bourgogne rouge coming from Meursault, in Les Durots on the Volnay side, and red Chassagne-Montrachet, a blend of Les Bouchons de Corvée and Le Poirier du Clos. 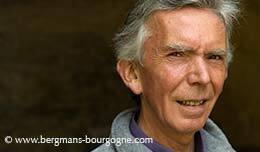 – Our father bought the Corton Bressandes in 1971 and replanted it, says Marie-Anne Bouzereau. The first harvest was in 1974. Today the yield is so low that we are planning on uprooting and replanting again. – In fact, the reds are probably where the biggest changes have been made since our arrival at the domaine, she continues. We are de-stemming and doing a more serious sorting. We want to make lighter reds. Less tannic wines that are more accessible when young.